Why should parents be aware of Tourette’s syndrome? Two essential reasons come to mind. First, TS is not as uncommon as once believed. Once considered a rare neurological condition, TS exists in 1% of the population. The incidence among autistic individuals is higher. Statements from autistic adults and families report that 22%-30% of persons on the autism spectrum have a tic disorder or Tourette’s syndrome along with autism. Second, tics are managed much differently than behaviors. Intuitive interventions like discussing consequences, reward charts, and time outs make tics worse. 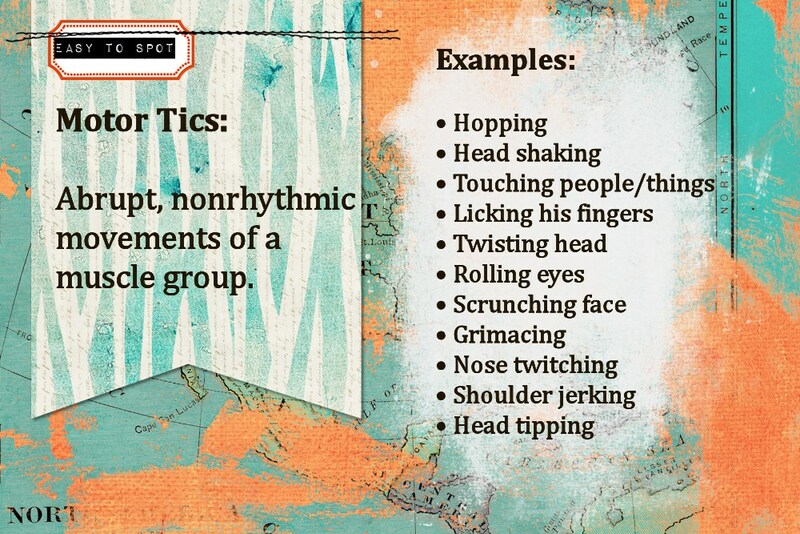 Learning to recognize tics will help you to manage behavior and pick your battles better. 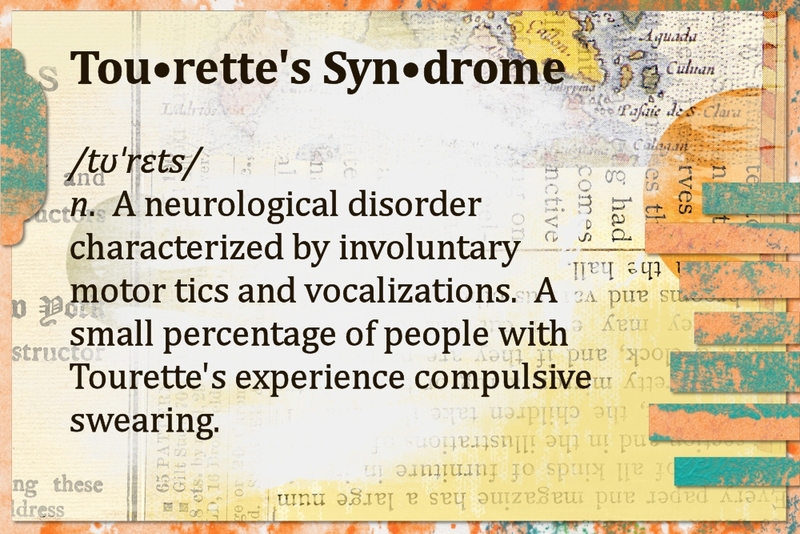 Tourette’s syndrome is defined by motor and vocal (phonic) tics present for more than a year. This simple definition surprised me, as did findings that tics themselves are quite common in the general population–20% of all children have them. This is why duration matters. A few weeks worth of tics is a transient episode, but a year of tics qualifies a person for a Tourette’s diagnosis. Motor tics are bursts of abrupt, irregular movements. Tics differ from the rhythmic, self-soothing stereotypies (“stims”) of autism. Stims are soothers– they involve either the whole or both sides of the body (flapping, rocking). Tics are eruptions of muscular activity activated by differences in brain chemistry and structure–if a stim is the gentle rolling of ocean waves, a tic is a sudden burst of rain. 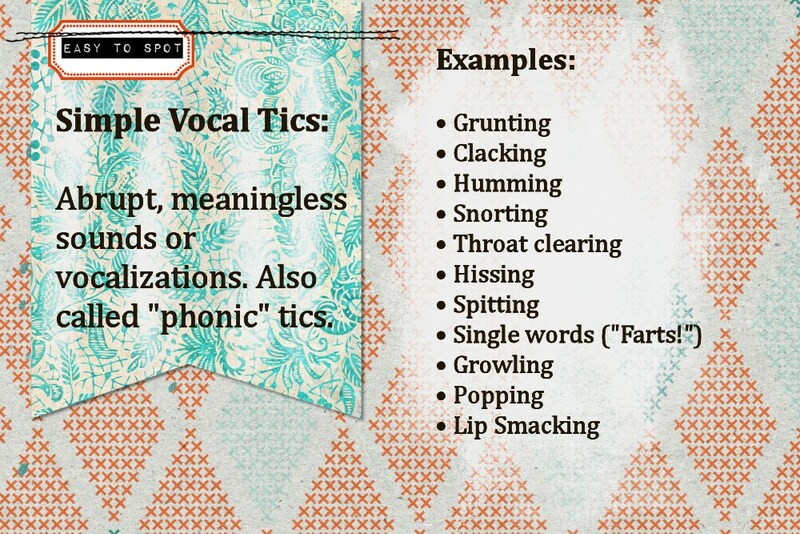 Vocal (phonic) tics are non-rhythmic mouth, throat and nasal sounds. Throat clearing, a word or even a phrase can be a vocal tic. A handful of throat clearings might be indicative of a cold. Six hours of purposeless throat clearing is likely a tic. Simple vocal and motor tics are considered to be manifestations of the same neurology since both involve discrete muscle groups. 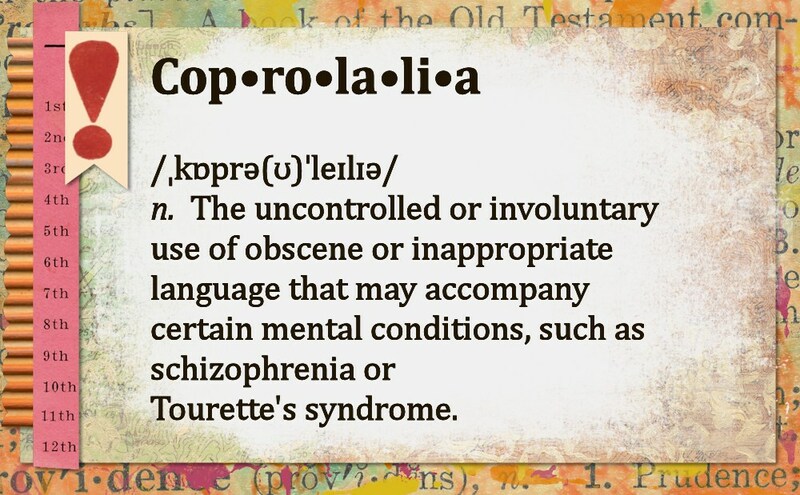 Coprophenomena is an umbrella term for socially unacceptable tics. Imagine that the brain has a control center for suppressing disturbing or inappropriate thoughts. Coprophenomena occurs when this control center not only fails to suppress the thought, but actually forces the thought to be yelled or acted out. These actions are impulses, not premeditated acts. A person may feel compelled to write the words “stupid” and “farts” on paper, but they do not write hate-filled personal rants. On a Tourettey day, my son might dump liquid soap into the bathroom sink or squash tomatoes in the veggie basket. Preventing these tics is often as simple as removing temptation–store the liquid soap under the sink and cover the tomatoes with a dishtowel. I also do not lecture/punish. My son knows not to squash tomatoes. On good days, I could line the floor with juicy tomatoes and he would step right over them. 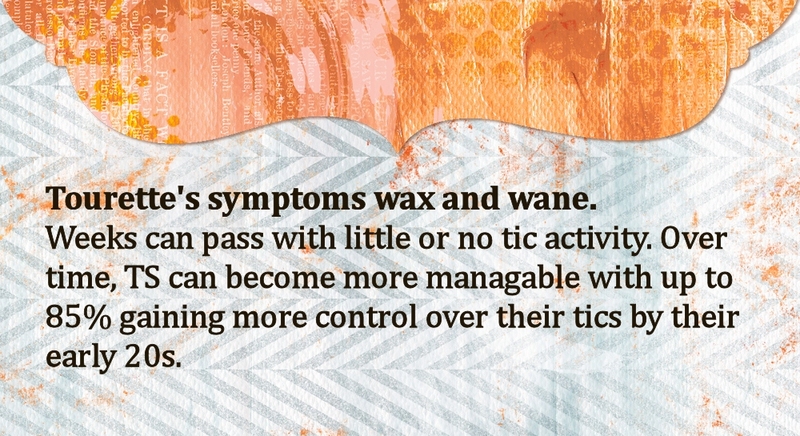 A perplexing component of TS is the waxing and waning of symptoms. Not only do episodes of tics come and go, but predominant tics change as well. This unstable, changeable pattern of behavior exasperated and exhausted me. I collected and analyzed notebooks of data, but found no consistent reasons for his behavior changes. Until we realized it was neurological. If you find yourself struggling with behaviors that do not reliably respond to your behavioral plans, consult a pediatrician or neurologist. Compose a list of your experiences and ask if autism alone can explain the behavior your family is experiencing. Tourette’s syndrome, OCD, and ADHD can all occur with autism and present unique needs. Symptoms even overlap and mimic autism, especially Tourette’s and OCD. Our biggest problem was recognizing that our son’s Tourette’s syndrome was separate from autism. If you have questions, please call the Tourette’s Syndrome Association. They can give you a list of physician referrals and ease your concerns. I owe my peace of mind to them. Tourette’s vs Autism Stereotypiesfrom the Tourette’s Syndrome, Now What? website. Jan 20 2013 Sep 24 2015 Lori D.
Lori! This is a fantastic gamut of information. It definitely has given me good information to ponder. I had blanketed several of Daniel’s behavior’s under autism. I need to take a look at some things and research a little more. There are certain behaviors that I do not understand and it is exhausting trying to help him and try to figure it out. It may not be Tourettes Syndrome, but it could lead me into information that I can ask his doctor. I am so glad to hear that I was able to help. OCD and ADHD also can cause confusing behaviors. OCD is compulsive behavior whereas ADHD is impulsive. Our bathrooms are stripped bare since he feels compelled to dump stuff in the toilet. Two years of lecturing him on why he needs to not do this have made these behaviors very stubborn. When he can see something dumpable on the counter, whoosh! There it goes.The hard part was figuring this out since sometimes he was a maniacal toilet flusher and other times an angel! Thank you for this post. My son does utter the same short phrase over and over and I always suppose it is echolalia because it seems to serve a soothing purpose, but I’m not sure an its definitely something to bring up with his neurologist to be sure. It seems that it can be hard distinction to make in some cases. Absolutely! It is hard to tell the difference, because echoalia can be a TS symptom, too. My experience would be to think the echoalia is a stim since he is reapeating it over and over. If it has any rhythm, it’s a stim. My son will rub his eyes till they chafe–his eye rubs are very jerky and irregular. If TS is an issue, you’d see plenty of other tics. When I contacted the Tourette’s Syndrome Association, they had lots of expereince talking to parents of children with autism, since these concerns are common. Thanks for dropping by and sharing with me! Very informative post. My son with Aspergers has motor & vocal tics but no formal diagnosis of Tourettes. They become more pronounced when he is tired, anxious or sick. He accepts them as part of the bigger neurological picture but they do stress him out if people notice. Hi, This post is what brought me to your blog. I’m currently researching and reading up on tics as our son (high functioning autism, add and sensory issues) developed a tic of throat clearing about 9 weeks ago. After the third week he added a little fake yawn at the start. He also puts his hand to his mouth, as you would to stop germs with a cough. I completely understand where you are coming from. We were lucky because we saw tics in Tyoma from his 5th birthday on. We only connected to TS when the cursing started. 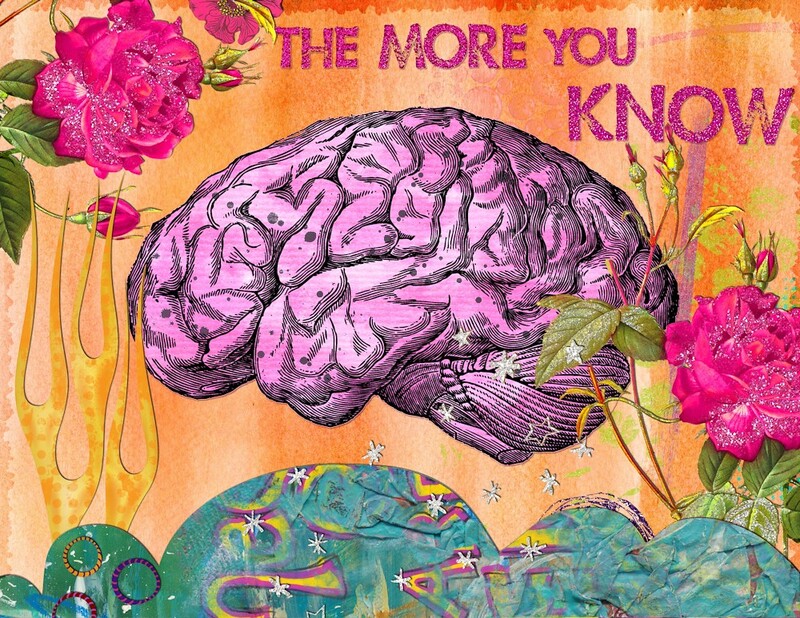 You are very wise to recognize tics for what they are and to educate your self. One of the confusing things about TS for us was that tics would come and go AND they would change. For a while it was bosom honking and now it’s little punchies! Many adults with ASD communicate overlapping neurological conditions. I have mild TS myself. As a child I never cursed, but I had enough vocal tics to annoy everyone but my folks. When I was 12, I gained enough control to keep quiet until I was alone. Many others with ASD and TS report the same experiences. I realize this is anecdotal, but this profile repeats on message boards frequently. Arrgghh..help, my nephew has high functioning austism and also has tourettes, which up until recently has just been a mouth grimace , he has always had a potty mouth and I have put that down to his mother having a potty mouth (she really is a wonderful woman, so please don’t misunderstand me) lately he has been smoking (she says he has nicotine psychosis and that’s where all the the bad behaviour comes from). he leads you into to carefully planned conversations that eventually end with him saying something really really disgusting and with a smile on his face…is this really tourettes ? he can take 5 seconds or 5 minutes to get you there and the conversation can start with “Did you know that some people work at night” and end with “why do some men like to **** **** ***** ” and its all related, he is very clever with a big IQ and very talented in music, but his behaviour is destroying him and his family, Mum cant sleep cos he climbs out the window, he is also threatening to kill himself. what to do, what to do ?? I am working on a thoughtful response to your post. It may take me a bit as I want to be thorough. I must open with a disclaimer, before I can offer my opinion. I am not a doctor nor can I offer medical advice, nor can my advice replace medical treatment. Seek professional help when self-harm is indicated. I can share my thoughts as a person with abundant autism, Tourette’s, OCD, bipolar, giftedness, and schizophrenia in our family. The primary question is “are these behaviors (on purpose to gain or avoid something) or are they part of Tourette’s?” Considering your nephew’s high IQ, Tourette’s, and autism diagnosis I suspect that he feels compelled to have these sorts of conversations. Compelled means despite knowing he should not do this, he does it anyway. His mental wiring is askew and he gets stuck in a loop and repeats a vulgar behavior. The repetitiveness is a major clue, especially with Tourette’s. My recommendation is to ignore it and it will fizzle out on its own. The more drama that surrounds the behavior the more entrenched it can become and the worse the family will feel because there is no easy fix for neurology. Even if this is a true behavior unrelated to OCD/Tourette’s, I still think ignoring the conversation is best since you will not be re-enforcing the behavior with a negative reaction. A good behaviorist can help your family determine why he is engaging in this behavior, provided it is a behavior. Behavioral interventions like habit-reversal training can help TS people, but not always. Sometimes medication that treats OCD can help. My dad and I both take OCD meds to reduce hair-pulling and self harm behaviors. Concerning “nicotine psychosis.” I’ve worked with schizophrenics for years and many of them smoke to combat their psychotic symptoms, including a close relative who is both schizophrenic and autistic. I’ve never heard of “nicotine psychosis” but if your body is getting too much nicotine, you will begin to see dramatic and painful digestive symptoms. You did not mention your nephew’s age, but often the body’s changes during puberty unleash new symptoms. Any drastic behavioral changes should be investigated since bipolar and schizophrenia often surface in the teens. I close with a plea for your nephew. Please don’t let this “behavior” destroy a family. Treat him with compassion and assume that he does not intend to cause upset. Read Mama Be Good’s Facebook page for excellent advice on parenting autistic children—she has helped me much over the years. I wish you and your family the best. After reading this, I have to give greater consideration to the possibility that these are tics, not behaviors. I’ll observe them more closely and make an appointment with his Autism doc for further assessment on what may be happening. At least, this gives me a place to start and for that I am very grateful! I am thrilled to read your message. Your son sounds so much like Tyoma. I hope this helps you find a good way to cope with what is happening with your son. Sorting tics from behaviors is challenging, yet it relieves so much tension to ignore or gently re-direct. I look forward from hearing from you in the future on how things work out. Please feel free to comment here or PM me on Facebook. Thank you all I have felt so alone. My son just turned 13 and he has tourettes and autism. I have been dealing with so much. I also have 3 younger children and one of the younger boys also has Autism. It is so hard trying to figure out what is a tic,what is stimming, and what is him just being an annoying big brother. Yes it’s the waxing and waning that always catches me out. I have to remind myself that they’re not ‘gone,’ but sitting behind the curtains waiting to jump out again when I least expect them.